Monochrome (Single Color) ribbons are used primarily for line art, text and barcodes. The DataCard 532000-053 Go Green HQ Black (K) monochrome ribbon ensures high-quality print results. The kit contains a premium black ribbon designed to render black text, images and perfectly scannable barcodes. The ribbon can imprint up to a total of 1500 images per roll. 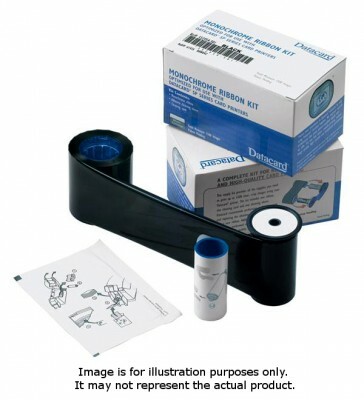 Also included is an adhesive cleaning sleeve for removing dirt, dust and other minute particles. Finishing the kit is an isopropanol cleaning card that helps ensure no contaminant ruins the quality of the card prints. Replacement Product for: Datacard 532000-002 Ribbon.